Supplied by DHD Dolls House Direct. One of the largest Dolls House makers in the UK with over 60 designs to choose from. Owners of Hearth and Home Miniatures and Lili-Anne Bathroom collection. 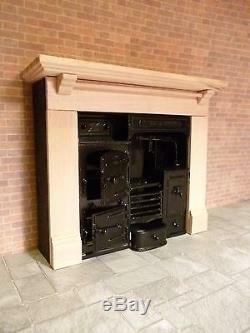 Victorian Range Cooker Including Surround. Metal range cooker Working doors Surround with hanging bar above stove. Comes with coals that light up. True to 1/12 scale Genuine Phoenix range cooker Model. Mid Victorian, With hinged opening doors. Overall size: 61/2 " wide x 5 1/2" high x 1 1/2 deep. This item is ready made. We sell the stove on its own as a. The item "Dolls House Kitchen Stove Range Cooker includes Surround Ready made DHD92" is in sale since Wednesday, December 31, 2014. This item is in the category "Dolls & Bears\Dolls' Miniatures & Houses\Kitchen Fittings & Appliances".